Welcome to the Kobuk Valley National Park Information Page. The closest major airport is Anchorage, AK with smaller airports at Kodiak and Homer, AK. Kobuk National Park is about 26 miles (64.75 square kilometers) north of the Arctic Circle. There are no roads or rail service. General access is via scheduled air service from Fairbanks or Anchorage to Kotzebue and then air taxi from Kotzebue to nearby villages. There are several incoming and outgoing flights to Kotzebue each day, although with less frequency December through April. Summer access to and through the Park includes motorized and non-motorized watercraft, aircraft and by foot. Winter access includes snowmobiles, aircraft and by foot. The closest major airports are Fairbanks and Anchorage, AK. There are also airport at Kotzebue and Nome, AK. Kobuk Valley National Park was created in 1980 under the Alaska National Interest Lands Conservation Act (ANILCA). This act states that Kobuk Valley National Park is to be managed “for the following purposes, among others: To maintain the environmental integrity of the natural features of the Kobuk River Valley, including the Kobuk, Salmon, and other rivers, the boreal forest, and the Great Kobuk Sand Dunes, in an undeveloped state; to protect and interpret, in cooperation with Native Alaskans, archeological sites associated with Native cultures; to protect migration routes for the Arctic caribou herd; to protect habitat for, and populations of, fish and wildlife including but not limited to caribou, moose, black and grizzly bears, wolves, and waterfowl; and to protect the viability of subsistence resources.” Archeological and ethnographic resources are specifically discussed in the enabling language for the park and it is very rich in both. Prehistoric resources within the park are extensive and of national and international significance. Kobuk Valley National Park has a gross area of about 1,750,700 acres, of which 1,669,813.00 acres is in federal ownership. Within the park there are 182,767 acres of designated Wilderness lands. About 81,000 acres of non-federal lands lie within the park. The state of Alaska claims about 9,500 acres (mostly submerged lands), with the rest divided among several Native Alaskan interests, including NANA Regional Corporation, Ambler Village Corporation and Kiana Corporation. These include 61 Native allotments, and 94 acres of cemetery and historical sites. Kobuk Valley National Park is open year round. The majority of park visitors come in August. The Kobuk River begins in the central Brooks Range. 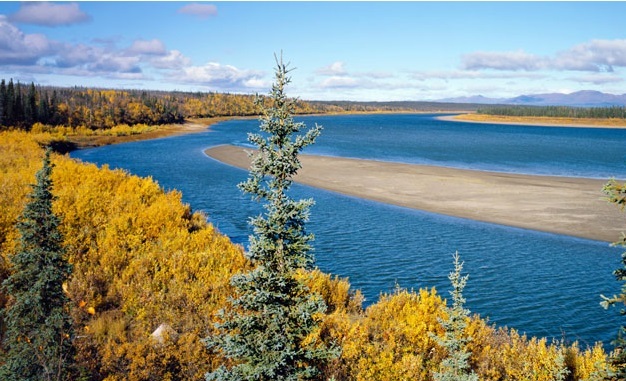 The river’s mid-section, as it passes through the Kobuk Valley, is wide, slow-moving and clear, and its banks and bottom are sandy. Rushing clearwater tributaries to the Kobuk have their headwaters in the Baird Mountains. These are the Akillik, Hunt, Kaliguricheark, Tutuksuk, Salmon, and Kallarichuk rivers. Only slow moving creeks enter the Kobuk from the south. Trees approach their northern limit in the Kobuk Valley, where boreal forest and arctic tundra meet. Large expanses of tundra cover the valley in some locations, while forests cover the better-drained portions. In some places sparse stands of spruce, birch, and poplar grow above a thick ground cover of lichens (reindeer moss). Sand created by the grinding action of glaciers (mostly during the Pleistocene) has been carried to the valley by wind and water. Large sand dunes lie on the south side of the Kobuk River. These are the Great Kobuk Sand Dunes, the Little Kobuk Sand Dunes, and the Hunt River Sand Dunes. Older, vegetated dunes cover much of the southern portion of the valley. Kobuk valley provides important fall and winter range for the western arctic caribou herd. Bands of bulls and cows may be seen here from late August through October as they migrate across the Kobuk River on their extensive annual migrations. Caribou migrations are one of the wonders of the subarctic and arctic realms. Traditionally, caribou have been among this region’s chief food sources for human, predators, and scavengers. The populations of some other animals species may even fluctuate with that of the caribou. Native peoples have depended on caribou for food, clothing, shelter, and tools, using the entire animal. In the 19th century, two Inupiat societies, the Akunirmiut and the Kuuvaum Kangianirmiut, occupied the area now included in the park. Descendants of these people, referred to collectively as “Kuuvangmiit” still use the park and now live in the villages of Kiana, Ambler, Kobuk and Shungnak. The first U.S. Census of the region was conducted in 1900. At that time, the second largest village encountered along the Kobuk River was at the mouth of the Hunt River (now within the park). This village was near Camp Penelope. Grinnel, one of the Kobuk stampeders living at Camp Penelope, provides some accounts of the first substantial contact with Euroamericans. Coordinated ethnographic, historical, and archaeological study of the village and Camp Penelope can open exciting and unique interpretive, historical and methodological vistas. The site of Stonewall Jackson’s (Oolyak) cabin and camp, at the Kallarichuk ranger station, is being eroded by the Kobuk River. Oolyak, interviewed by Giddings, was one of the last Kobuk Inupiat to reach adulthood prior to sustained Euroamerican contact. Archaeological investigation of the site and interviews with his descendants could provide a powerful illustration of Inupiat acculturation. There are no roads or rail service to Kobuk Valley National Park. General access is via scheduled air service from Fairbanks or Anchorage to Kotzebue and then air taxi from Kotzebue to nearby villages. There are several incoming and outgoing flights to Kotzebue each day, although with less frequency December through April. Summer access to and through the Park includes motorized and non-motorized watercraft, aircraft and by foot. Winter access includes snowmobiles, aircraft, and by foot. The Interagency Kotzebue Public Lands Information Center and the headquarters offices are accessible. The Onion Portage site, on the Kobuk River in the eastern side of the park, is one of the most important archeological sites in arctic America. It has more than 70 distinct stratified cultural layers that document a progression of human camps spanning about 12,500 years. Kobuk Valley National Park is perfect for primitive backcountry experiences, as there are no amenities in the park. Be prepared before you go into the park. Kobuk Valley National Park has no campgrounds. Visitors can camp on the tundra, except on archaeological areas and on private property. Fishing can be good when rivers are clear and fish are running. An Alaska fishing license is required for all persons 16 years of age and older. Alaska seasons and regulations apply. No fees Alaska hunting and fishing licenses, available in Anchorage or Kotzebue, are required. Be prepared to bring your own food and supplies. There are no amenities in the park. There are some amenities available at Kiana, Ambler, and Kotzebue. First aid is not available in the Park, but is available in the villages of Ambler and Kiana. The nearest hospital is in Kotzebue. The Kobuk Valley National Park is a remote, rugged area with lots of primitive hiking and backcountry experiences to enjoy. There are no roads and no trails in Kobuk Valley National Park. Kobuk Valley National Park is a vast area subject to harsh weather, high winds, rain and snow. Summers are mild and cool with extended daylight. Winters are extremely dark and harsh. The Kobuk River typically thaws by early June and freezes by the last week of September.